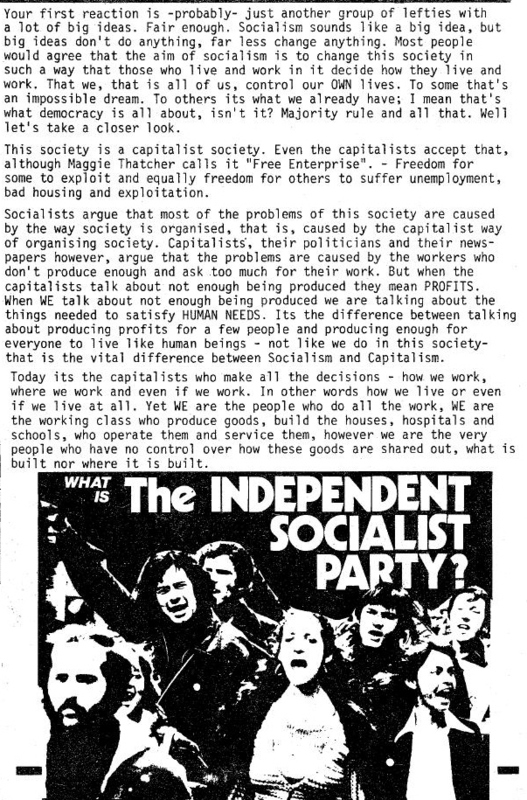 A Leaflet from the shortlived Independent Socialist Party entitled ‘What is The Independent Socialist Party?’. Its from around 1977. Plenty of interest as they explain what their version of socialism is. The Party had addresses in bothe Dublin and Belfast. From Wikipedia.. The Independent Socialist Party was a far left political party in Ireland. It was founded in 1976 as a split from the Irish Republican Socialist Party named the Irish Committee for a Socialist Programme, calling for more prominent socialist politics and less emphasis on paramilitary activity…. “Join the Independent Socialist Party” with details of the party’s aims, a piece on Socialism in Ireland and the directions it has taken since 1968 and also membership details on the back. The Contact details for the Independent Socialist Party are ‘The Five Eighth Bookshop’ which was a small bookshop run by Johnny White. What else I know is that The Independent Socialist Party was shortlived (1976 to 1978) and came from a split with the IRSP. I’d assume this leaflet is from 1976. The Independent Socialist Party was a far left political party in Ireland. It was founded in 1976 as a split from the Irish Republican Socialist Party named the Irish Committee for a Socialist Programme, calling for more prominent socialist politics and less emphasis on paramilitary activity. The following year, it renamed itself the “Independent Socialist Party” and was joined by former UK Member of Parliament Bernadette McAliskey. The party entered discussions with the Socialist Workers’ Movement (SWM), with the aim of forming a joint organisation, but the SWM chose instead to join the Socialist Labour Party in 1978. As a result, the Independent Socialist Party decided to disband. You will also find some more information here.